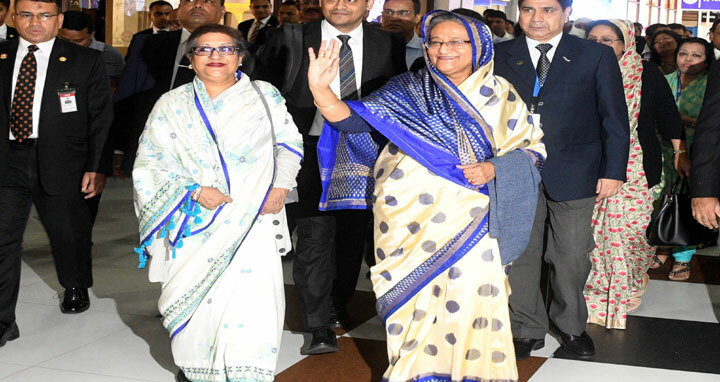 Dhaka, 23 April, Abnews: Prime Minister Sheikh Hasina returned home this morning concluding her eight-day official visit to the United Kingdom and Saudi Arabia. Sheikh Hasina paid a two-day visit to Saudi Arabia from April 15-16 at the invitation of Saudi King Salman bin Abdulaziz Al Saud to join the concluding ceremony of a joint grand military exercise named "Gulf Shield-1". During the visit, Sheikh Hasina attended the Commonwealth Women Forum as a presenter at the session on "Educate to empower: Making equitable and quality primary education and secondary education a reality for girls across the Commonwealth" at Queen Elizabeth II Conference Centre, Westminster. Sheikh Hasina joined a high-level programme organised by Overseas Development Institute (ODI), a prestigious think tank of the UK, as the keynote speaker on "Development Progress of Bangladesh: Policy, Progress and Prospect". The premier also attended an event titled the "Asia leaders' roundtable: Can Asia keep growing?" and held bilateral meeting with Indian Prime Minister Narendra Modi.